Tankless Water Heaters, also called Instantaneous or Demand Water Heaters, provide hot water only as it is needed. Traditional storage water heaters produce standby energy losses that cost you money. We do not leave our homes heated while vacationing. We only heat our homes when there is a demand for heat. In the same way, a Tankless Water Heater is used only when there is a demand for hot water. Tankless Water Heaters heat water directly without the use of a storage tank. Therefore, they avoid the standby heat losses associated with storage water heaters. When a hot water tap is turned on, cold water travels through a pipe into the unit. In an electric Tankless Water Heater an electric element heats the water. In a gas-fired Tankless Water Heater a gas burner heats the water. As a result, Tankless Water Heaters deliver a constant supply of hot water. You don’t need to wait for a storage tank to fill up with enough hot water. Typically, Tankless Water Heaters provide hot water at a rate of 2 – 5 gallons (7.6 – 15.2 liters) per minute. Typically, gas-fired Tankless Water Heaters will produce higher flow rates than electric Tankless Water Heaters. Some smaller Tankless Water Heaters, however, cannot supply enough hot water for simultaneous, multiple uses in large households. For example, taking a shower and running the dishwasher at the same time can stretch a Tankless Water Heater to its limit. To overcome this problem, you can install a “whole house” type Tankless Water Heater or install two or more Tankless Water Heaters, connected in parallel for simultaneous demands of hot water. You can also install separate Tankless Water Heaters for appliances—such as a clothes washer or dishwater—that use a lot of hot water in your home. 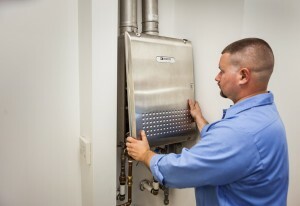 There are many manufacturer’s of tankless hot water units, but having an experienced professional install your unit is critical to safety and correct operation. Call Diliberto today to find out how you can save money and have endless hot water.